Nikki Villagomez is a self-professed type geek and urban explorer cataloging urban typography and lettering she finds in cities across America. We talk to her about her favorite discoveries, the taming of the urban aesthetic and of course, manhole covers. Ulrik Hogrebe: Hi Nikki — I am super pleased that you could join us today. I’ve been digging around your blog and really enjoy what you do. I feel you have taken a type spotting — a favorite pass time of type designers and enthusiasts everywhere and elevated it to the next level. But maybe you’d like to explain a bit about what you do and what your background is? Nikki Villagomez: Thanks for taking the time to look through my blog! So, my “day job” is Director of the Creative Studio for Dixon Hughes Goodman, the largest Accounting firm in the Southeast. My job is to manage the firm’s brand and the Creative Studio team. On the side, my “passion project” is researching how culture affects typography. I started my blog shortly after taking on this in-house role 7 years ago. 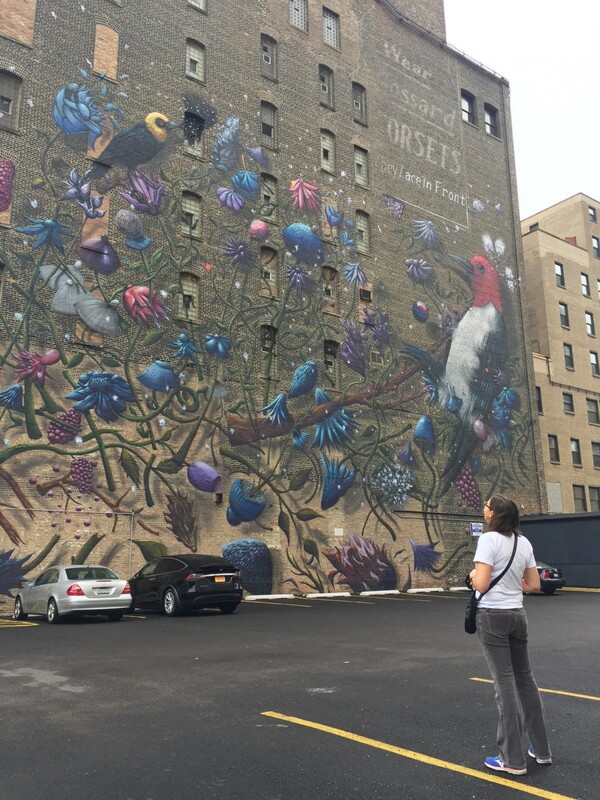 On my blog, I compare pictures side by side from different parts of the world and discuss the typography, illustrations, and graffiti. UH: That’s such a great passion project. Can you talk a bit about your process? NV: Yes! So when I started my blog, I think I had about 60-ish pictures that I’d taken in the course of my own city and type explorations. Not that many and my goal with my blog was to post 5 days a week, 2 pictures a post. So, I burned through my pictures pretty quick! Then, one Sunday morning, I was drinking my coffee and scrolling through Twitter and saw @FriendsOfType tweeted: Keep those submissions coming! #citytype @designmuseum #fontsunday. I quickly learned that the Design Museum in London hosts #FontSunday every Sunday. They assign a theme and ask people from all over the world to contribute to this theme. This particular Sunday, Friends of Type was curating the tweets for the theme ‘city type’, so typography specific to your city. I randomly tweeted at people if I could use their pictures on my blog and so on that Sunday, I went from having about 18 pictures left to over 300 from all over the world. Since then, I have just been adding to my library of images; from ones I take myself on my speaking engagements as well as ones that people send to me. UH: Cool. It’s such a great project — both speaking as a type nerd but also as one who is interested in local cultures and how they manifest in general. Looking through your blog, the images touch on so many things; the history of a place, the history of type, the type manufacturing process — with everything from letters chiseled in stone to bent in neon — all the way to how a particular culture is expressing themselves in an area in the moment. What do you look for when you are out and about? What makes a truly good find for you? 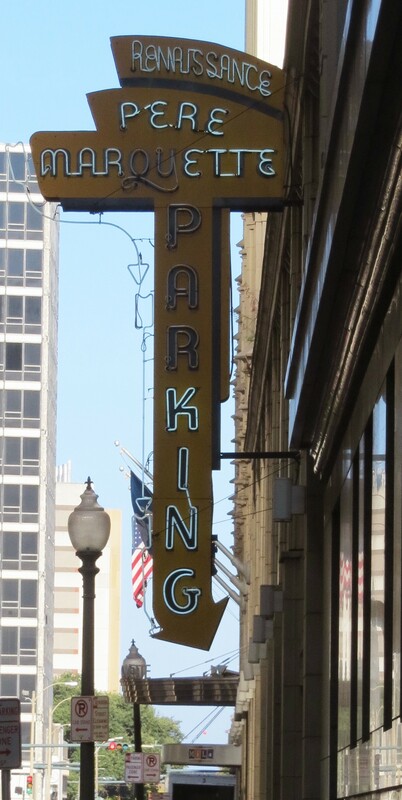 NV: A true gem for me is a sign or unique lettering that is specific to a city. For example, a manhole cover that says the city name is very unique as opposed to a manhole cover that says ‘Bingham & Taylor’ or ‘Bell South’, those aren’t so unique (It only took 3 question for me to bring up manhole covers, ha!). I like to look in unexpected places like the bottom of industrial foundation beams (usually stamped with the contractors company name), concrete stamps, graffiti and wayfinding signs. UH: Ha, yes — I figured that would come up. So apart from the city type — or maybe as an extension of — you have an obsession with manhole covers? Talk to me about that. NV: Well, things came full circle for me when Design Museum reached out to me to host #FontSunday and they asked me to pick a theme. I went with manhole covers because, as you’ve probably guessed, it’s been one of my passions for a while. So, one glorious Sunday, my Twitter blew up with tweets from people all over the world sending in pictures of manhole covers. I was happy to know it wasn’t just me looking at these pretty little things! It was such a wonderful experience and I had so much fun and it’s just fueled my obsession ever since. I admire their designs, they are like beautiful coins in the ground that get trampled on, trucks drive over them, most don’t even notice their intricate detail. I have always been drawn to little details. Manhole covers epitomize that. They are all very different even though their basic size and shape are similar. Some have really intricate illustrations and others have ornate patterns. They are fascinating to discover. The best are the manhole covers from Japan since often their illustrations are in color. 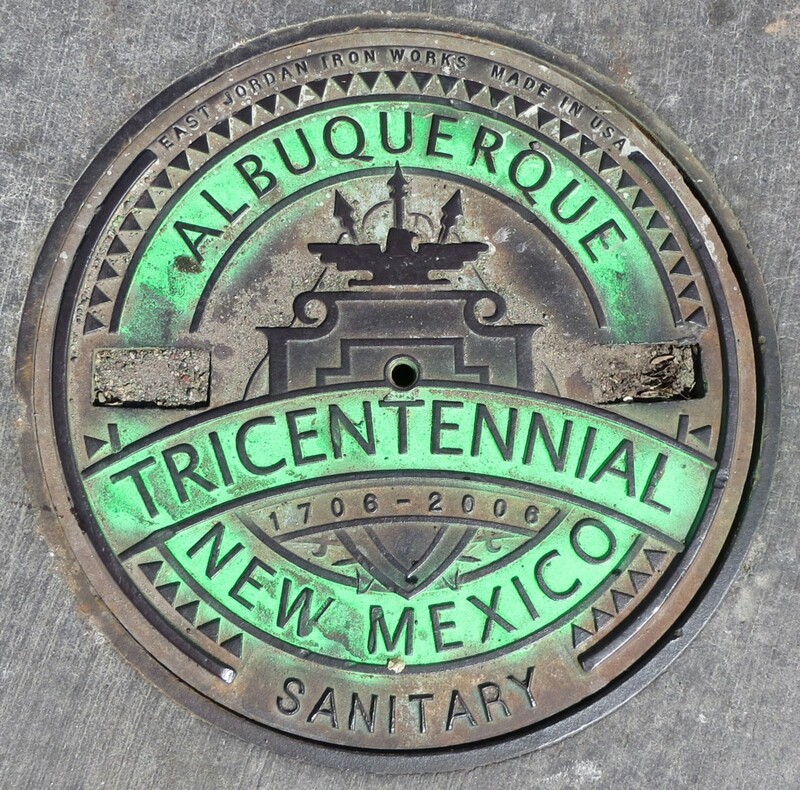 In researching the history of manhole covers and coal hole covers, I have found some which date back to the 1800s. UH: I like the idea of these manhole makers imbuing the low with the high, if you follow me. Like their is a particular London or English ‘brand’ called Stanton Warrior which was created by Stanton Ironworks. I like the idea of these iron workers putting so much craft and pride into these objects. NV: That’s right, it’s completely unexpected and a lot of the designs are just beautiful. They have to be utilitarian and functional but at the same time, they are visually pleasing. They don’t have to be, someone is taking the extra time to make them that way. So anyway, after the first manhole cover experience, I wanted to relieve it again. I just needed the right opportunity… I had a major life event this past August — I turned 40. So, instead of going on a big trip or buying a tricked out car, I put out a call for submissions on my social media. I asked for everyone to send me a picture of a manhole cover with 1 piece of career advice to be included on a poster titled 40 Covers: A project dedicated to manhole covers and people who are 40, turning 40 or have turned 40. So basically, anyone. 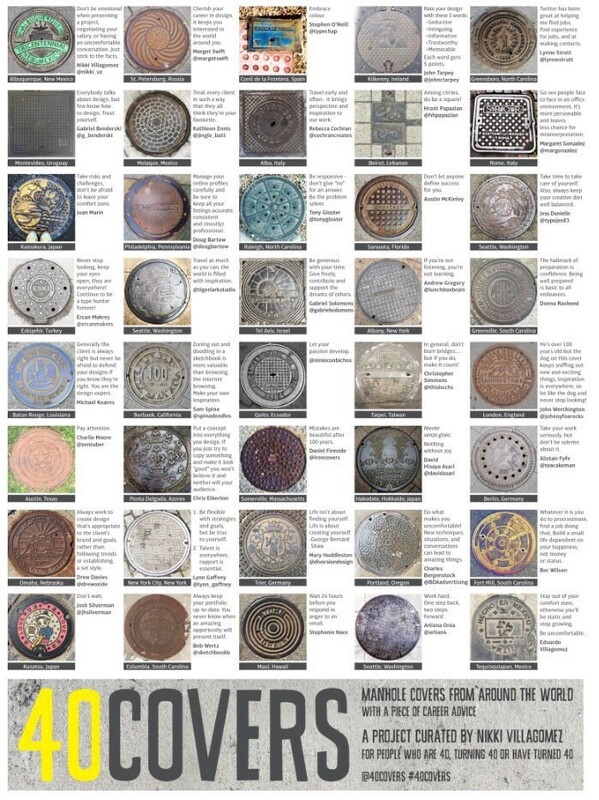 The first 40 submissions made it on the poster and it was a great way to celebrate my love of manhole covers and giving back to the career that has done so much for me. UH: Some of the other things you are into are things like graffiti and general street ephemera. Tell me a little about how you see those things? Are you able to read an area’s culture through this stuff? NV: Absolutely. The typography I find on the streets walking around a city varies mainly depending on the economic status of the city. If it’s a wealthy city, I see more neon signs, murals painted from commissioned artists, newer signs advertising businesses. It’s harder to find interesting historic typography in the revitalized areas (typically the downtown areas) because it’s been covered up or removed. It’s easier to find interesting typography in the cities that don’t have as much money or where revitalization hasn’t occurred…unless the city really celebrates their history (like Baltimore, MD and Charleston, SC). A lot of the buildings are on the National Register of Historic Places so the signs have to be saved/restored. On a similar vein, most cities, I have found, don’t celebrate graffiti. It’s viewed as a distraction and they look to cover it up as soon as possible. In Miami, for example, they celebrate their graffiti. They have an entire neighborhood called the Wynwood Arts District that recruits graffiti artists from all over the world to paint murals on the walls. The business owners take a sense of pride if a street artist tags the side of their building. The Banksy that is in Miami is covered in plexiglass to protect it. That’s an example of one city and how it’s handled so different there. UH: Is this something you see a lot? A sort of taming of the urban aesthetic? NV: Yes, as old businesses move out and new ones move in, they bring their new signs and designs with them. I have a quote from my book that is “the culture that lives in a city is like a virus trying to stay alive”. I mean ‘virus’ in the most positive way possible — there are the small locally owned businesses that struggle to keep their doors open when big box stores move in. 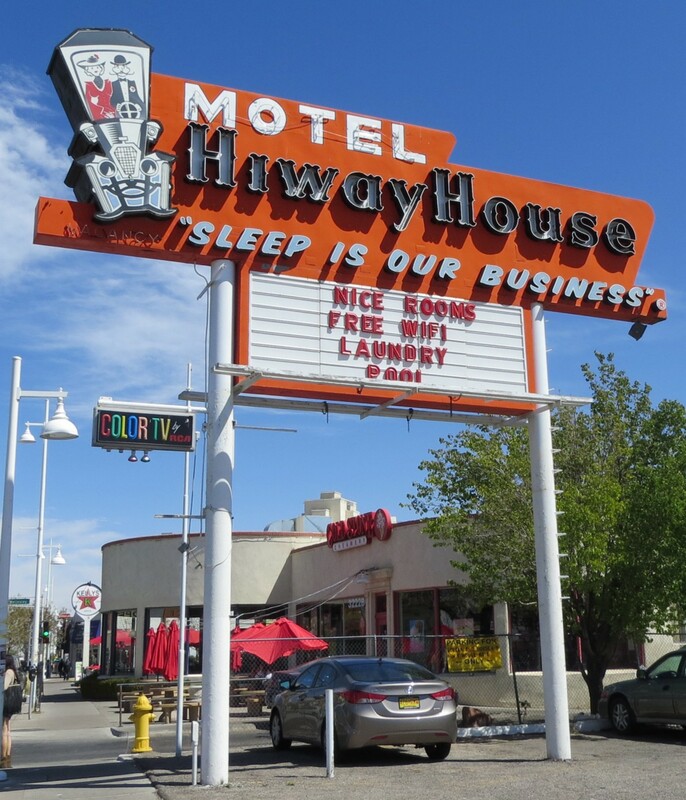 You can’t put a price on the history of a sign that has been hanging there for 80+ years. The best example I have for a ‘virus staying alive’ was found on the main street in Sioux Falls, South Dakota. 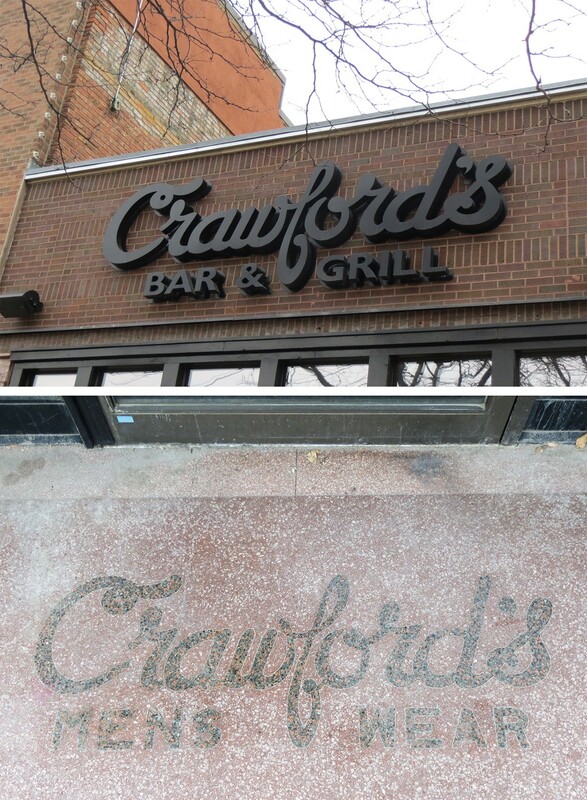 Crawford’s Bar & Grill. Crawford’s used to be Crawford’s Mens Wear and before that it was a locally owned butcher. The new owners moved in a few years ago and instead of rolling out a new design for the restaurant, they paid respect to the history of the original logo and celebrated the butcher aspects still inside the building all these years later. It’s amazing. UH: That is beautiful. Not to be overtly nostalgic but of course, that kind of stuff is literally the ghost of an era and it’s sometimes a shame to see it rolled over by modernist sans-serifs etc. (not that I don’t like those). Also I see local differences in manufacture and craft disappearing; you’d have local sign-painters and metal workers, and their styles would be unique from place to place — whether it’s Copenhagen artisans where I am from or New York ones, you can see a difference. Cultural preferences and proclivities. And that’s being erased by modern printing techniques and branding. Sigh… OK, it’s impossible not to be somewhat nostalgic. So what are some of the more exotic things you have seen? What has surprised you most? NV: I loved being in Albuquerque and seeing the signs along Rt. 66. Lori O’Hara, who was on the AIGA New Mexico board when I flew out there to speak, took me around the Nob Hill area and we just walked around exploring and looking at their amazing signs. They are all in really great condition and the colors are so different from what I was used to seeing in Akron, Ohio(where I lived at the time). I think what has surprised me the most is going into a city with a pre-conceived notion of what that city is going to look like and then what it actually looks like. For each of my talks, I ask local creatives to send me pictures of the typographic landscape that they think makes their city unique. The weeks before speaking to AIGA Orlando, I was expecting to receive a lot pictures of Disney World. I didn’t receive one (until the night before I boarded my flight). What I discovered is that the locals don’t want to be associated with the tourist traps. Same thing happened with AIGA San Antonio. I was expecting a lot of pictures of the Alamo…I didn’t receive one. They don’t want to identify with the monuments and what others know about the city or what the media makes their city out to be. There have been some really neat discoveries along the way like these. UH: Amazing. So are you planning anything for the future? More manhole projects? More typography projects in general? Or is there some place you are dying to visit? NV: Yes! My long term goal is to take my talk international. I haven’t been to Europe yet and would love to be able to speak there and research the culture and typography. I am currently making my way through the AIGA chapters with my speaking engagements so that’s another goal. 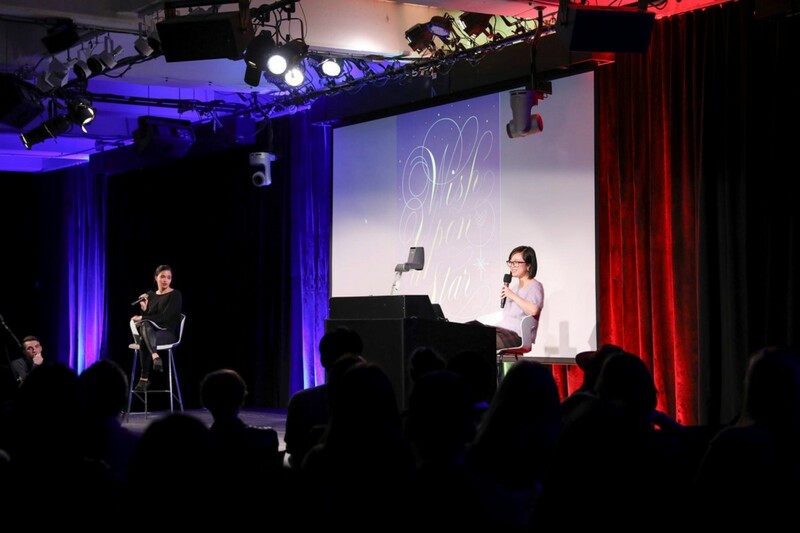 On October 5th, I gave my 30th AIGA chapter talk to AIGA Chicago. I will continue to research manhole covers as I make my way through each city! Ulrik Hogrebe: Fantastic! I am looking forward to seeing more of it. Thanks again Nikki — really great to chat to you. Best of luck in the future.